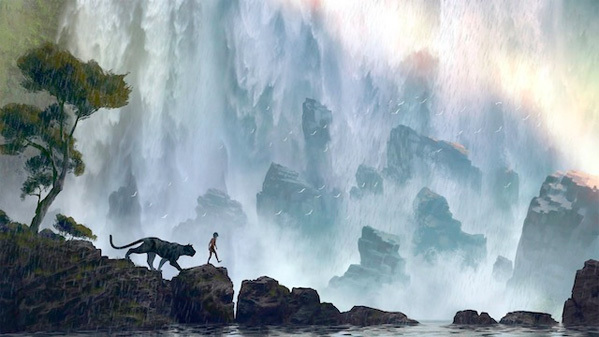 Just a few days after Warner Bros. Pictures announced they had delayed Jungle Book: Origins back to October of 2017, Disney felt like firming up their plans to release their own adaptation of The Jungle Book on October 9th, 2015. Production is underway on the film right now, and while we don't have a first look at the film from the set (likely because there will be tons of visual effects used to bring the animals to life), a piece of concept art has surfaced giving us a glimpse at Mowgli (played by newcomer Neel Sethi, the only actor who will be seen on screen) and the black panther Bagheera (voiced by Ben Kingsley). Look! The Jungle Book is directed by Jon Favreau (Iron Man, Cowboys & Aliens, Elf, Zathura, Made) and written by Justin Marks (Street Fighter: The Legend of Chun-Li), based on Rudyard Kipling's classic book of the same name. The film follows a young boy named Mowgli, a man-cub raised in the jungle by a family of wolves, who embarks on a captivating journey of self-discovery when he’s forced to abandon the only home he’s ever known. Ben Kingsley, Lupita Nyong'o, Christopher Walken, Idris Elba, Scarlett Johansson and Bill Murray voice the animal characters in the adaptation Disney will release on October 9th, 2015. Well? Nice. Looks very interesting. I will watch out for this one.